Pfaff sewing machines bear the hallmark of that famous German precision and attention to details. If you are looking for a machine that will allow you to explore and experiment without ever letting you down, this is it! Powerful, precise and feature-filled, Pfaff sewing machines are definitely your ticket to a world of endless creative possibilities, whether you are a serious sewer looking to hone your craft or a newbie just getting the hang of sewing. From the first Pfaff made 145 years ago by Georg Michael Pfaff, these powerhouse machines have had their competition biting the dust. Successive proud and talented Pfaff teams have consistently dedicated their efforts towards implementing newer technologies and creating sewing machines that have always been ahead of their time. Today, these machines continue to make history as the premier brand that all sewers aspire to own. 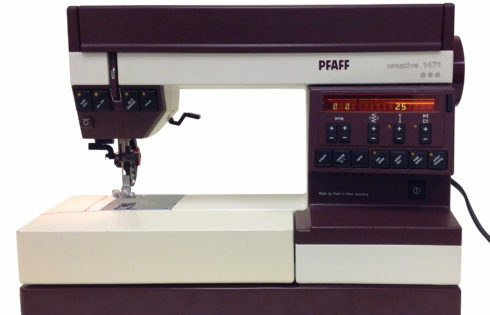 To simplify the choices, the company markets Pfaff sewing machines through 4 different lines so it is easier for users to find the perfect model that suits all their needs within their budget. Expression Line: Well designed, user friendly and chockfull of features including multiple decorative stitches, the machines in the Expression line are a dream to use and promise endless possibilities. The Expression 3.0 from this line offers the highest level of sewing ease combined with advanced technology that allows you give reign to your imagination. The Quilt Expression 4.0, also from this line gives quilters the freedom to explore and realize their quilting potential. Ambition Line: Marketed as a line that allows you to take your creativity further, the sewing machines in the Ambition line do just that with their advanced features and functionalities and that too, at a price that is much lower than their competition. Some of the features you will find here include an array of decorative stitches and alphabets ( up to 195 stitches in some models), high resolution touch screen, up to 29 needle positions and the trademark, original IDT System. The Ambition 1.0 and Ambition 1.5 are two of the most popular models in this line. In addition to a well-lit illuminated sewing area that makes it easy to sew under any light condition, these models also offer a sewing space that is larger than most and a long free arm that makes sewing projects of any size effortless. Select Line: Sewers who own Pfaff sewing machines from this line will vouch for the fact that these machines are always ready to go! Versatile, with a modern look and very practical features, all three models in this line- Select 2.0, Select 3.0 and Select4.0, come with the Easy Select System that allows you to choose any decorative stitch you want with just a touch of a button. With such an easy to use feature, you just can’t go wrong! Hobby Line: Promising endless possibilities at a very low price, the Hobby line is every crafter’s dream come true. Every machine in this line, Hobby 1142, 1132, 1122, is easy to use and each comes with a different range of accessories and features so you do not have to pay for something you will never use. If you are looking for more features, more accessories, and more creative possibilities, you don’t have to look further than Pfaff sewing machines!